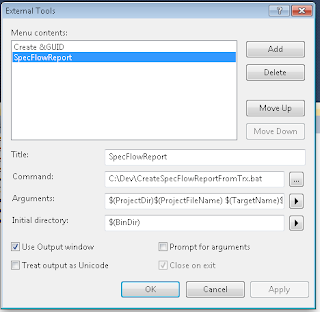 With your SpecFlow installation comes SpecFlow.exe that is a program that can be used to generate tests from the scenarios AND to create nicely formatted reports from the generated test results. There's been a lot written on how to generate these reports when your using NUnit (see this and this for example), but when it comes to managing this for MsTest there's been almost silent. And facing this problem I can sure see why... It's a bit trickier. With this step you can generate the test from you scenarios. SpecFlow.exe picks up your configuration and generates the test in your test framework of choice. OK. I put together a .bat file that does that. (Note that I’m on a 64-bit machine and had to use some funky DOS-shortcut to get there. No simple way to be architecture agnostic I’m afraid). I’ve added some line breaks for readability. Well – that was easy. To get this step to work we have to run the test and get hold of the location of the test report file (.trx). When you do this from within Visual Studio the test reporting is done in a TestResult folder and the file get a name with a timestamp. That is not very script-friendly sadly and we’re forced into writing a bat-file that also run the tests. Again, watch out for me using a 64-bit Windows and use %programfiles% if you’re not. Some strangeness with MsTest made me delete the testResults.trx before each run. Also MsTest create some folders (username_testrun...) but that doesn’t bother me now. The projectFile is the Visual Studio Project File containing features and specifications. No really – the first one (generate test from features can most certainly be handled by Visual Studio in most cases. Or in any case will probably not run in conjunction with the other two steps. So you need to send the name of the test container (the .dll) and the project file. Save that file to a known location so that you can point your external command to it. Note that the project with specifications has to be selected before the External command can be run. 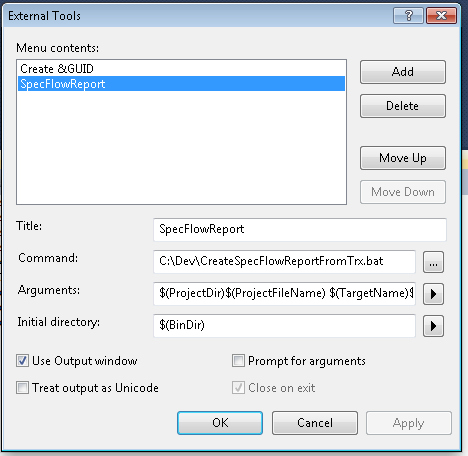 In this blog post I’ve learned how hook up SpecFlow to generate tests and reports for me.